According to Dino Ari, pizza originated in Turkey, his home country and the place he emigrated from to Canada in the year 2000. 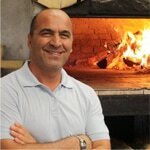 Having worked for his family’s bakery shop in Turkey making dough, opening a pizzeria in Canada came naturally to him. To this day, he uses his family recipe to make the pizza dough. The menu is a salute to his culture and offers customers a unique glimpse into the history of his cuisine. He is very proud of the business he started and grew more than eight years ago. While owning a restaurant is hard work, especially in the summer when the pizza oven reaches 1,000 degrees, Dino is nonetheless satisfied that his efforts have paid off. He is also very happy to get the opportunity to have a successful business and raise his kids in Canada. He feels like he owes a lot back, which is why he gives back to the community through charity. Dino has said that there are a lot of opportunities in Canada for newcomers and that anyone can do anything if they work hard enough. New immigrants usually relocate with a very healthy work mentality and therefore work hard to achieve a better life for themselves and their families. If you would like to consider Canada for your future, Canadian Visa Expert will provide you with the information you need to follow your dream.